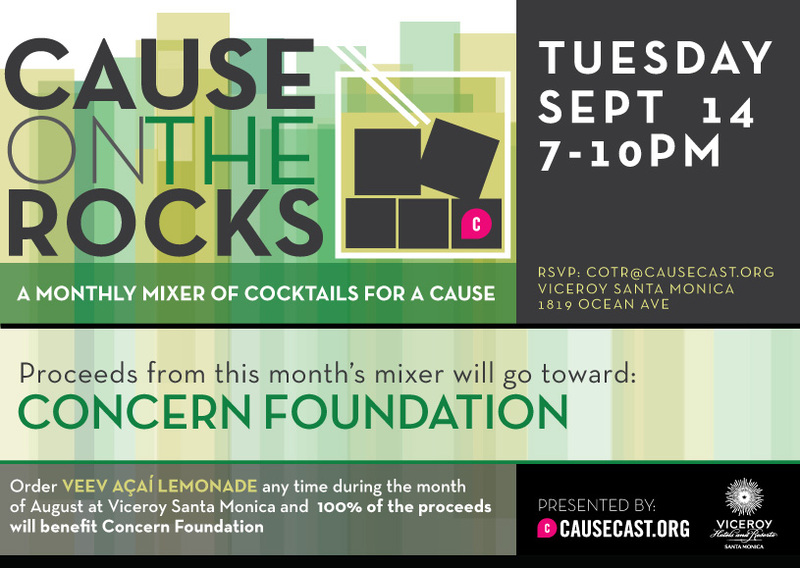 On Tuesday, September 14, mingle with cause-minded individuals, sip great cocktails and enjoy live music at Causecast’s Cause on the Rocks, the monthly mixer of cocktails for a cause, taking place at Viceroy Santa Monica. For every VeeV Açaí Lemonade purchased during Cause on the Rocks, 100% of the proceeds will benefit LA-based Concern Foundation, and its second generation organization Concern 2, both dedicated to raising funds to support cancer research worldwide. Concern Foundation has provided grants to over 600 cancer researchers at major institutions locally, nationally, and around the world. Concern 2 is focused on raising money and awareness of children’s cancer. Best of all, Cause on the Rocks is FREE; there’s no cover and no guest list! So bring your friends, make new ones, and don’t forget to order plenty of VeeV Açaí Lemonades. Cheers! For more information about Causecast, visit causecast.org. For more information about Concern Foundation and Concern 2, visit concernfoundation.org.